Garlic – Garlic is currently being studied in the treatement of bacteria resistant to pharmaceutical antibiotics and the results are promising. Researchers have found that garlic posseses anti-bacterial properties on it’s own but they have also found that garlic enhances the effect of chemical antibiotics on resistant bacteria. Garlic is also anti-fungal and anti-parasitic. Studies are inconclusive if it works against viruses but traditional medicine uses garlic for all sniffles, coughs, fevers, and infections. Add extra raw garlic to hummus, pasta sauce, soups, stews for yummy flavour and microbe killer action! Basil – We have a ton of basil growing in our garden this year. In fact, 5 of our neighbours have sheepishly admitted to stealing our basil leaves! I think my enthusiastic mini-lecture on it’s wonderful anti-microbe properties took them by surprise. But, truly, I love this herb. Basil’s anti-bacterial properties are also being studied for usage in drug-resistant bacterial infections. Specifically E. coli infections. And happily, basil works to kill these super-adaptive little guys. It has also been shown to kill viruses – and researchers are checking into it’s anti-parasitic characteristics. One of the reasons I love this herb is that kids will often chomp on basil without complaint. You can add it to everything. You can make your own basil oil by adding a bunch of fresh or dried basil to olive oil and let it sit for several hours. Add garlic and, boom, microbes don’t stand a chance. Rosemary – Have you seen those gorgeous rosemary potted “Christmas trees”? They’re beautiful and so easy to care for. And…anti-microbial! Rosemary also works to kill E.coli resistant to conventional antibiotics and is used to kill fungus, parasites, and viruses. Studies have focused specifically on the Herpes virus and, again, results are positive. Rosemary is a pretty strong flavour but can be added to potatoes (especially roast potato skins), meats, breads, pasta and rice dishes. Ginger -Ginger kills all kinds of nasty microbes. Here are a few germs that researchers have found ginger to be effect against: Streptococcus, E. coli, Pseuomonous, H.pylori (these are bacteria – some of which are resistant to pharmaceutical antibiotics), herpes simplex virus, human respiratory syncytial virus, Blastocystis hominis (a tiny and determined parasite), Candida species. So… bacteria, viruses, parasites, and fungus. Pretty great. Lately my hubby has been putting ginger into sauces with honey and garlic which are delish. The kids will dip veggies and sausages in ginger honey sauces. And they’ve enjoyed ginger, lemon, strawberry popsicles. Nice. I haven’t even mentioned that garlic helps the cardiovascular system, rosemary and basil work as tremendous antioxidants, and ginger works as an antinausea. Oh, and all of them have anticancer properties. Oh, and they’re delicious! Here’s to lots of flavourful herbs to kill microbes and keep us healthy. 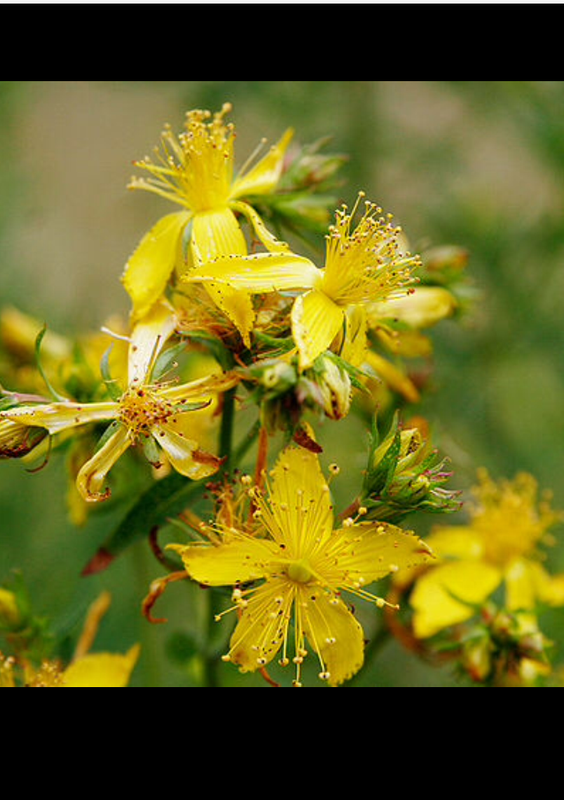 Hypericum perforatum (St. John’s wort) aka “The Sunshine Herb”. 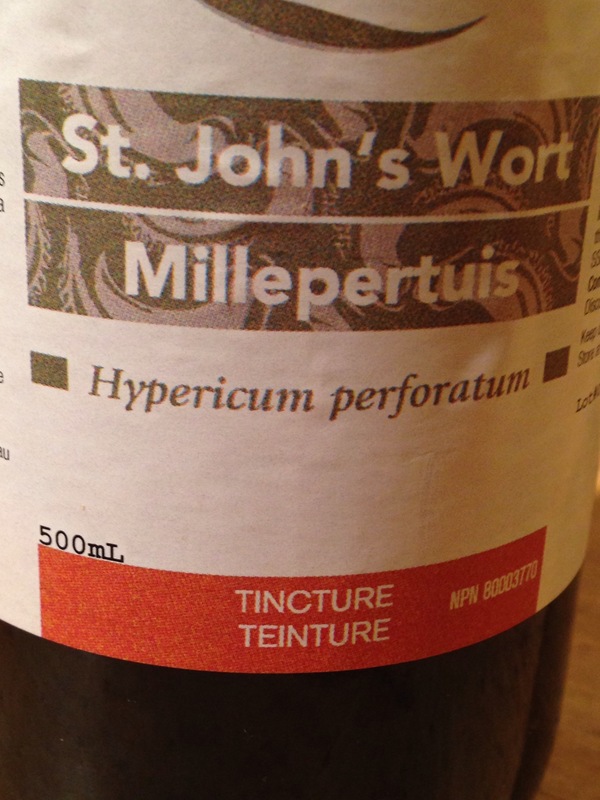 As the light changes this season, a few drops of the tincture can be lovely. (If you’re taking meds, check with an ND before taking Hypericum).